The University of Maine at Presque Isle’s ART 101 Basic Design class is participating in a campus-wide project to make their (temporary) statement on the University. The students were tasked with creating “tape graffiti” installations, using painter’s tape and a whole lot of imagination. The projects are being displayed throughout campus—in Folsom/Pullen Hall, Gentile Hall, Park Hall, Emerson Annex, Preble Hall, and the Campus Center. Using painter’s tape, students are creating artwork that includes everything from larger-than-life images of Star Wars characters Darth Vader and Anakin Skywalker to a 12-foot-tall pointed compass. The project itself is about design fundamentals and using shape quality to create a public piece of artwork. 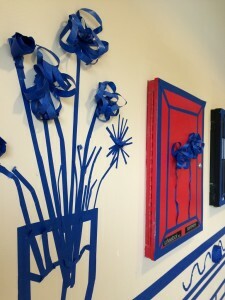 Students were permitted to use only blue painter’s tape and to create a piece that interacted with an “opening” on campus. This could have been a door, window, vent, or crack in the pavement. Students first scouted their locations and took photos, and then designed their installations from the resource photos they took. Proposed areas were approved by campus officials. Sincavage also hopes that community members will take the opportunity to visit campus and view the student projects. The Tape Graffiti installations are only on display for a limited time—all of them will be taken down by Oct. 20. For more information about this project, please contact Sincavage at 207.768.9441 or email her at heather.sincavage@maine.edu.